» Underwater Welding 101: What is Underwater Welding? Underwater Welding 101: What is Underwater Welding? There is a growing demand for skilled underwater welders. This need has grown from advanced underwater construction and repair procedures. A tradesman who is a certified diver and trained in underwater welding can pull down a great salary. Deep-sea development of pipelines, oil and gas exploration and marine infrastructures continues to grow. These factors make this an excellent specialization within the welding trade. Underwater welding involves commercially-trained divers who work submerged underwater. This can be either in a separately-contained dry environment or directly in the wet sea. Underwater welders work in underwater construction, underwater surveying, and offshore construction. 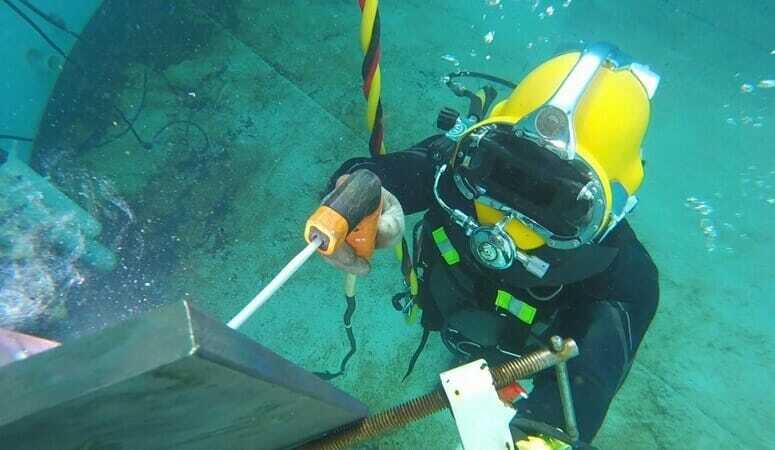 Underwater welding can be “wet” or “dry”. Underwater wet welding means the diver is directly in the water. A shielded metal arc stick welder is used. The gas bubble from the arc on the stick welder protects the weld. The welding machines are powered by DC current supplied through an underwater cable. Underwater dry welding involves creating dry enclosures underwater around the weld area. A chamber has air pumped in to create a workspace. So the diver to work in a properly pressurized air to create a weld. An underwater welder must first receive formal instruction from an approved school or program. The American Welding Society sets requirements for certification. 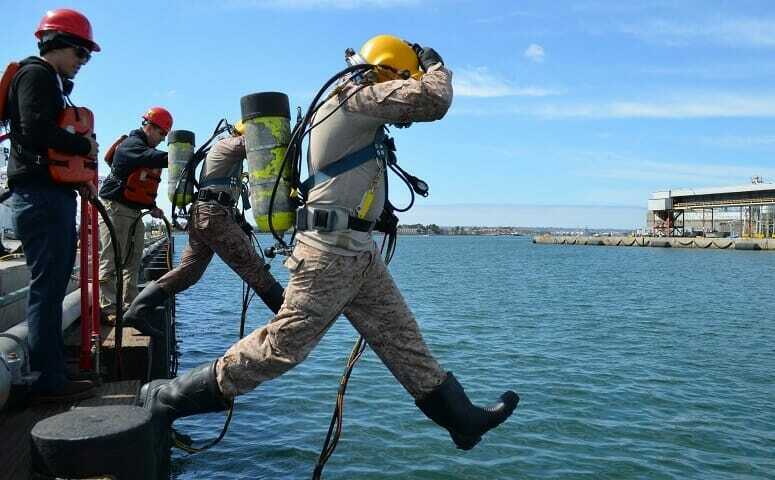 Additionally, the welder must complete a commercial diver’s certification/licensing program. This career calls for a large amount of training. Therefore underwater welding is considered a highly-specialized field. Underwater welders regularly handle big equipment specifically designed for their work. They work in an uncertain, often hazardous environment. It is not surprising that there is a significant amount of risk. The nature of diving exposes a welder to decompression sickness (“the bends”), hyperthermia, and drowning. It’s important to be a trained diver and to follow the proper diving techniques. Visibility underwater is more limited than on the surface. So the chances of making a mistake are greater. All welders work with electricity and flame, which is a hazard in itself. Being underwater amplifies these risks. Work in deeper water is also more dangerous than in shallower areas. In offshore underwater welding, the risk of explosion can be higher due to the amount of fuel stored on offshore oil rigs and marine vessels. Your welding arc in a pressurized chamber can also be erratic. This can heighten risk for shock or explosion. Additionally, if gases enter the chamber, the weld operator could suffocate. All these risks are manageable. Our goal isn’t to scare you out of this job. But it’s important to realize that even more care needs to be taken to work in this industry. 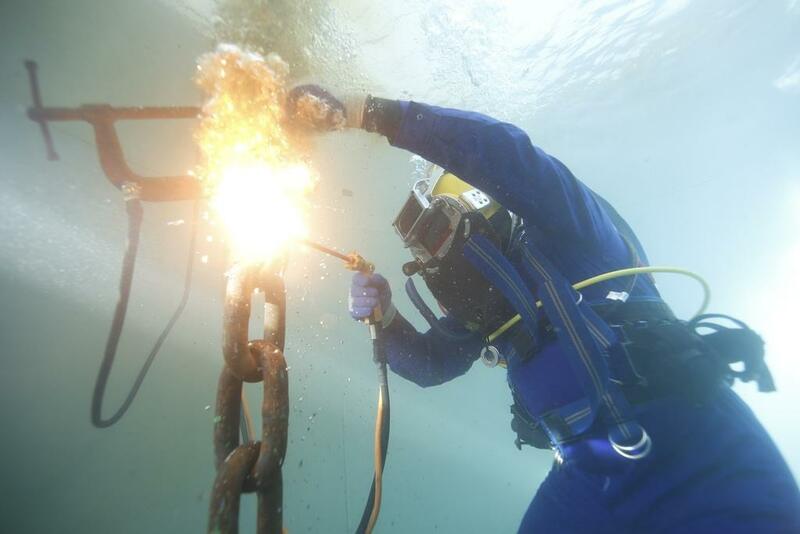 Underwater welders typically work for a commercial diving contractor. But many are also directly employed by marine construction companies, shipping companies, oil and gas companies, or the military. This type of job requires considerable travel and underwater welders are often away from home for months at a time. This type of welding commands some of the highest salaries in the field. This is appropriate since it requires such specialized training and skillsets. Typically underwater welders are paid by the project. The amount they are paid is heavily influenced by the environment they will be diving in, the depth of the project, the diving method used, and the type of welding required. According to the American Welding Society, underwater welders can command salaries in the $100,000-$200,000 range. Underwater welders are needed both offshore and inland. Inland underwater welders earn less, at about $50,000-$80,000. Their work does not require significant travel or long periods away from home. They can also count on a normal 40-hour work week. Offshore welders can earn upwards of $100,000. Their work week is much longer and is often overseas. It involves a lot of travel and long periods of time away from home. On the other hand, offshore welders may only work about half the year. Just about any industry or application that involves structures, resources or work underwater will have need of an underwater welder. Inland Underwater welders work in ponds, rivers, and lakes. Typical tasks include building and repairing docks, bridges, dams and small boats. The majority of inland welding jobs are in freshwater. This can be a less-stable environment due to the lack of buoyancy. Offshore underwater welders work in deep-sea environments. They may be building and repairing oil rigs and large marine vessel hulls, welding pipes, installing I-beams under platforms and repairing large submerged machinery. Offshore underwater welders can spend months on an oil rig or marine vessel. They often work over 60 hours a week. Offshore underwater welding cannot be conducted in severe weather or the winter months. Many offshore underwater welders only work seasonally. An underwater welder can use a number of wet welding or dry welding techniques. It depends on the type of project they are working on. Wet welding is conducted directly in the water. It uses waterproof stick welding equipment where the metal to be welded is surrounded by water. While wet welding is cost efficient, the weld quality can be affected by brittleness and may crack. This method is used in very few applications. Dry welding takes place in a submerged pressurized container. The weld operator and the weld joint are in a water-free cavity. Dry welding produces excellent welds but is an expensive process. There are two types of dry welding. This type takes place in a pen or enclosure in the water. It’s constructed and fixed to the structure to be welded by sealed clamps. Valves are used to remove the water and create a dry area that weld operators can work in. Cofferdams are frequently used to construct or make repairs to bridge piers, docks, locks and dams. This type is done at high pressures underwater. The diver is located within a hyperbaric water-free chamber with a life-support system. The chamber is constructed to surround the joint or area being welded. The chamber fills with high-pressure gas to force the water out. This provides a dry environment for the diver to do the needed repairs or construction. Hyperbaric welding requires specialized welding training in addition to certification in commercial diving. Welding school and training programs typically guide students from basic to more challenging welding positions and joint types. Basic welding courses can range from as little as 10-15 days. But to become an underwater welder, more training is necessary. Most people interested in this career start out learning the basics of welding. From there, you’ll want to study commercial diving. This is more advanced than the diving training you might have taken during your vacation in the Florida Keys. An underwater welder has to be certified as a commercial diver. After that, you’ll spend up to seven months learning underwater welding. Let’s take a look at just three of the top underwater welding schools across the United States. These are just a few of your options. Hydroweld USA can be found in Miami, Florida. They specialize in training welders with diving experience for underwater wet welding. They have a 45,000 gallon filtered and treated tank. The tank has three welding stations installed and fitted out to allow students to manipulate work pieces in any orientation required for underwater positional welding. Instructors have direct visual and audio communication with students to monitor progress and provide real-time instruction. After successful completion of the course, students receive a Lloyds Register Welder Performance Qualification (WPQ). This means they comply with the AWS D3.6M Code for Underwater Welding, class “B” welds. Hydroweld provides all equipment and general diving gear. However, students are responsible for their own wetsuit and booties, overalls, and steel-toe work boots. Completely across the country, you’ll find the Divers Institute of Technology in Seattle. This school offers an intensive 7-month 900 hour Commercial Diver Program. If you successfully complete this program, you’ll receive Entry Level Tender/Diver certification. This meets the requirements of the Association of Diving Contractors International and the Diver Certification Board of Canada. This certification program will train you in SCUBA diving, rigging techniques & procedures, and handling toxic materials. You’ll also learn basic NDT inspection techniques, job safety analysis, and maintenance requirements for critical life support systems. There’s also training in first aid/COR techniques & procedures. Students are responsible for purchasing their own gear and equipment, which can run up to $4,500. Tuition and fees for the Program can run $ 25,000-$26,000. Moving to another part of the country, you can find The Ocean Corporation in Houston. They have been offering training since 1969 and are recognized internationally and nationally. The Ocean Corporation program meets all the standards for the American National Standards Institute (ANSI) entry-level Commercial Diver Certification. Tuition and fees for the Program run about $20,00-$21,000. Ocean Corp’s program helps prepare you for work in the commercial diving industry anywhere in the world. 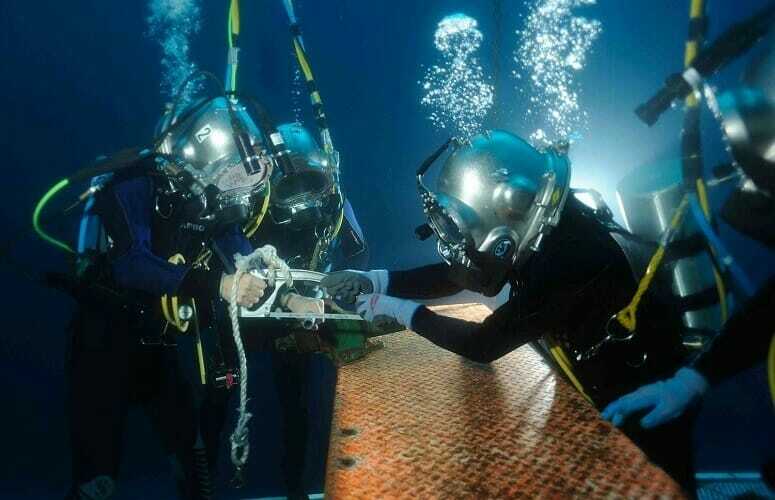 To get a job in underwater welding, you need to fulfill all the requirements to become a certified commercial diver as well as a certified welder. The American Welding Society has established the AWS D3.6M Underwater Welding Code. It sets forth the requirements to pass the tests for both wet and dry underwater welding certification. Typically, you can expect to spend anywhere from 7 months to two years getting your commercial diving certification. For divers already certified for commercial diving work, many companies also provide underwater welding training that can be completed in as little as 3-4 weeks. When you choose to get underwater welding training and certification, the world is your oyster. Salaries tend to be high and career opportunities are unlimited. While the job presents risk and often involves being away on the project site for months at a time, it also offers great returns.